This is a quick version of a succulent North Indian dish that my spiritual master Srila Prabhupada taught his young disciple Yamuna Devi (my cookery guru) in 1966. Yamuna went on to become one of the world’s foremost authorities on vegetarian cuisine. Serves 4. 2 small dried red chilies. Dry-roast the bay leaf, cinnamon and cardamom in a frying pan over moderate heat for 3 minutes, or until fragrant. Transfer to a mortar and pestle or spice grinder and reduce to a powder. Whisk the chickpea flour in a bowl with a few tablespoons of the water to form a smooth batter. Gradually whisk in the rest of the water, the yogurt, turmeric, coriander powder, salt, curry leaves, half the fresh coriander, and the dry roasted spice powder. Heat the mixture, stirring often, in a heavy saucepan over moderate heat. When it boils, reduce the heat slightly, and simmer for 10 minutes or until the sauce has thickened. Add the chickpeas, and simmer for another 2 minutes. Season: heat the ghee in a small saucepan over moderate heat. When fairly hot, drop in the cumin seeds and dried chili, and fry until the cumin seeds turn a rich brown colour. Pour the seasonings into the karhi, fold in the remaining fresh coriander. 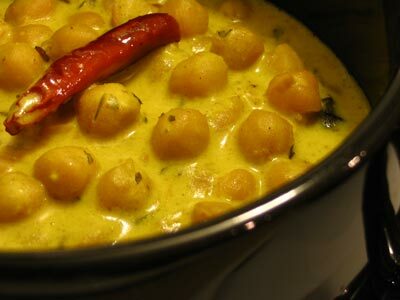 Serve the chickpeas in karhi piping hot, accompanied with freshly cooked rice.